The 2015 Visible Award has been developed in collaboration with Chris Dercon, Director, Tate Modern, and will be chaired by Francesco Manacorda, Artistic Director, Tate Liverpool, who will coordinate the debate, together with Andrea Phillips in the role of advocate for the projects, between a group of experts operating in different fields of culture, brought together to assess the merits of the artistic projects and lead the selection of the winner of the 2015 Visible Award. Among the invited experts: Assemble (art collective, London), John Byrne (Senior Lecturer in Fine Art at Liverpool School of Art and Design, Liverpool), Beatrice Catanzaro (artist, Milan), Anna Colin (co-director of Open School East, London), Ekaterina Degot (artistic director of the Academy of the Arts of the World, Cologne), Christine Eyene (Guild Research Fellow in Contemporary Art at the University of Central Lancashire), Magdalena Malm (director of the Public Art Agency, Sweden), Emily Pethick (director of The Showroom, London), Laura Raicovich (director of the Queens Art Museum, New York), Nato Thompson (chief curator at Creative Time, New York), and others. Abounaddara by Abounaddara Collective (Syria), Conflict Kitchen by Dawn Weleski and Jon Rubin (USA), Cinema Everywhere by Waguih El laqany (Egypt), Ecoart Uganda by Ruganzu Bruno Tusingwire (Uganda), Movimento Editorial by Cráter Invertido (Mexico), New World Summit by Jonas Staal (The Netherlands), Salt by Karrabing Film Collective (Australia), Mujawara / The Tree School by Campus in Camps and Contrafilé (Palestine-Brasil), White Paper: The Law / Convention On the Use of Space by Adelita Husni Bey (The Netherlands). If you wish to attend please register here. From Monday 26 October, for the week leading up to the public jury session, Tate Liverpool will host a free temporary exhibition of these nine shortlisted projects, each represented by a video in the museum’s public foyer. The jury session — live streamed on 31 October at the Visible website (www.visibleproject.org) and to audiences in Tate Liverpool’s foyer and open to interaction through social media — is not simply a dialogue between experts, in order to select an exemplary socially engaged art project, but also a moment for sharing knowledge and collective learning. In the process of assessing the winning project the jury will also offer an opportunity to deepen the debate around artistic engagement in the public domain. 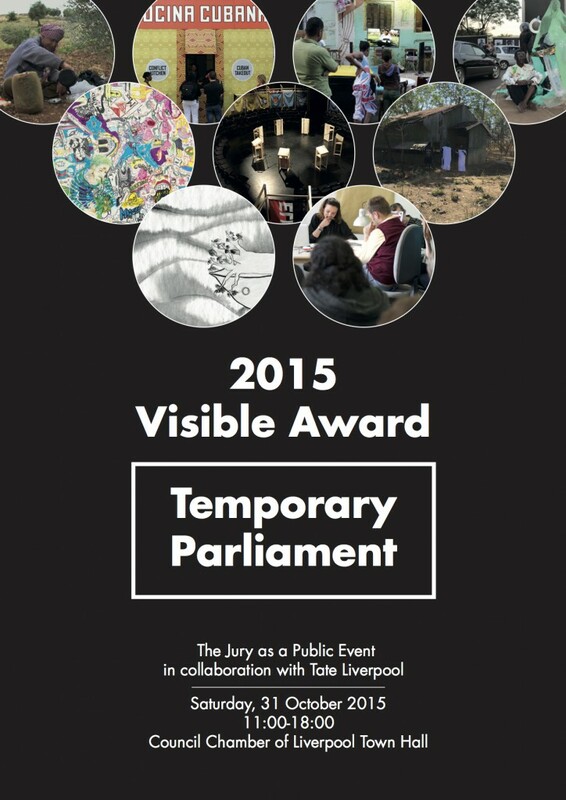 Projects shortlisted for the 2015 Visible Award have been publicly announced on 11 August 2015 during the evening event, The Night Art Made the Future Visible, part of the Creative Time Summit: The Curriculum, within the 56th International Art Exhibition of la Biennale di Venezia: All the World’s Futures. The winning project will be awarded in New York City on the 13th of November 2015 on the occasion of the second installment of The Night Art Made the Future Visible at the Creative Time Summit in New York.